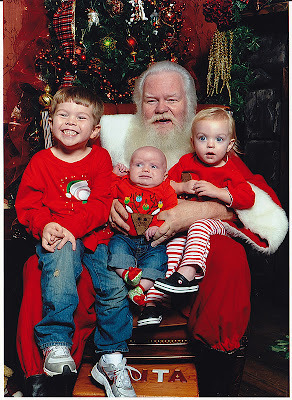 This year was special because Ben got to go with us to see Santa! We actually went on a mini vacation to Dallas. We had such a great week. We left on Wednesday and got to spend 2 nights at the Gaylord Texan. It was so much fun! We got up early on Thursday to see the real Santa at North Park. Hunter was super excited about story time. He was telling us one of Santa's stories from last year on the way to the mall. Santa at story time with his dog, Widget. Hunter thought it was super cool to see Widget. During story time... can you see Hunter?? I love my sweet kids! Hunter liked the "I'm not sleepy yet" story the best! Since we got there so early (#15 this year) we got to jump right in line after hearing his stories. Hunter loved every minute! Archer was a little scared of the elmo doll the photographer was putting in his face and Maggie didn't really know if she liked Santa or not. Hunter was so sweet talking to Santa. He didn't talk as much as he did last year, but he was so excited to see him. Santa gave him a few pictures. He thought it was so cool! Sweet Archer riding along in the mall. If you would have told me when Ben and I were married 7 1/2 years ago that we would be walking the mall pushing 2 stroller filled with our 3 kids, I wouldn't have believed it. It's crazy! We are so incredibly blessed! God is so good!